You are currently browsing the monthly Archive for February, 2011. “Journalism without photographs is like writing without verbs,” Mark Briggs said. Photographs are important in journalism, and in all other aspects, because they are able to expand on a story in a way that words cannot. In order to fully express an idea, journalists must understand how to capture the perfect image. When possible, shoot images using natural light. Avoid shooting with a flash or mixture of flashes. If bright sunlight is in front of subjects being photographs, it will create face shadows and make people squint; if the sun is behind the subjects then their faces will be darker. Great photographs are the ones where viwerers can see a picture within a picture. According to Val Hoeppner, the biggest mistake amateurs and beginners make is that they do not get close enough to their subjects or to the action happening in front of them. Hoeppner suggests taking 10 steps forward after journalists think they are close enough to a subject. Two secrets for capturing better photos are to be patient and to take more photographs. Once journalists are done capturing photos, they should then edit them for online publishing. Edit a copy of the photo – never the original. Tone and color correct the picture. Remember that adding and/or removing objects from an image is strictly forbidden. An image should never be altered in a way that can “mislead viewers or misrepresent subjects,” says Briggs. “In this day and age of photo manipulation, students new to photojournalism must understand and adhere to the ethics of not creating images that lie or are deceptive to the viewer,” says Colin Mulvany. According to computer scientists, cell phones are changing how we live and how we think about information. The advancement of cell phones has brought rise to mobile reporting. Reporters no longer have to depend on photographers or camera crews to capture an event, and can now rely on their handy-dandy multi-purpose cell phones. And if they aren’t at the scene to capture footage, they can turn to news consumers. Mobile reporting is especially helpful in breaking news situations when others arrive at a scene before professional journalists, according to Briggs. Mobile reporting allows anyone with a cell phone to contribute images, videos and/or information that journalists do not have in order to complete a story. Keep it simple. Minimize equipment. Be prepared. Have all the tools needed to report in any medium – at anytime, from anywhere. And remember, for a mobile journalist, the deadline is now. In ‘Microblogging: Write Small, Think Big,’ Briggs really emphasizes the benefits of microblogging. It assists in building interactive communities that allow members to quickly share and disperse news and/or information. While the emergence of microblogging has allowed journalists and readers to respond and react to one another right away, it is important to note that not everyone is part of the microblogging sphere. In Jenkins said that according to a Pew study, only eight percent of Americans on the web use Twitter, and of the eight percent, only two percent use Twitter on a typical day. Twitter represents a very small group of people. Re-tweets, replies and Twitters referrals do not adequately represent the interest or importance of your work as a journalist. Most people that use Twitter don’t use it to get news. It is important for all of us, especially journalists, to keep in mind that only a small population uses Twitter to obtain news. Therefore, we cannot primarily depend on microblogging to get readers’ attention. Briggs taught me that microblogging is a very useful tool to reach out in order to be “in the loop” of everything that is happening around me. His chapter has inspired me to turn more attention to Twitter and microblogging sites, but Jenkin’s blog reminded me that not everyone uses Twitter. While Twitter is an important news-gathering and news-dispersing tool, it is not the only one out there — and it is definitely not the only tool that readers use! A service that allows users to publish brief text messages, usually no more than 140 characters, with links to other Web sites, photos or videos. Allows you to share a link to the article you’ve written. Your content will get read much quicker. Connects you with other journalists and readers. Response and reaction is the WHOLE point of microblogging! 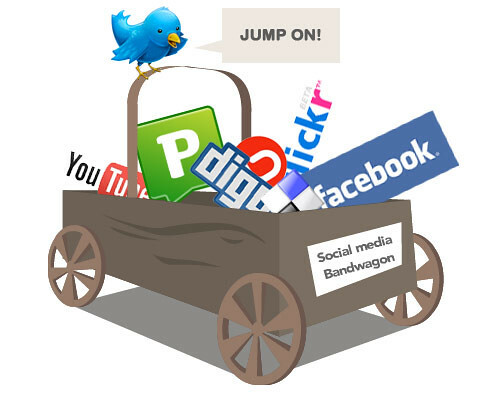 The biggest benefit of microblogging is learning about your audience. Invite your audiences to work with you. Your audiences could help you look for leads, find background or other information on a particular subject/event. It allows readers to know what is happening right now. Users on a scene can start spreading the word immediately. Countless news stories break first on Twitter. “One great thing about Twitter — and this is why it is so useful to student journalists — is that after a while it trains you to look for interesting things around you (and think how you can communicate that in 140 characters,” said Bradshaw, a journalism lecturer in Birmingham, England. “The opportunity of social media is important to younger journalists just starting out. News companies expect that interns and fresh-out-of-college new hires will possess a proficiency in social media. In fact, proficiency with new technology can help you land your first job” Briggs said. Mandy Jenkins, Social Media Editor of TBD.com, visited our class on Feb. 10, to discuss the importance of social media networks in one’s professional and personal life. Build a blog to reach a lot of people. You should do personal work to get yourself hired. 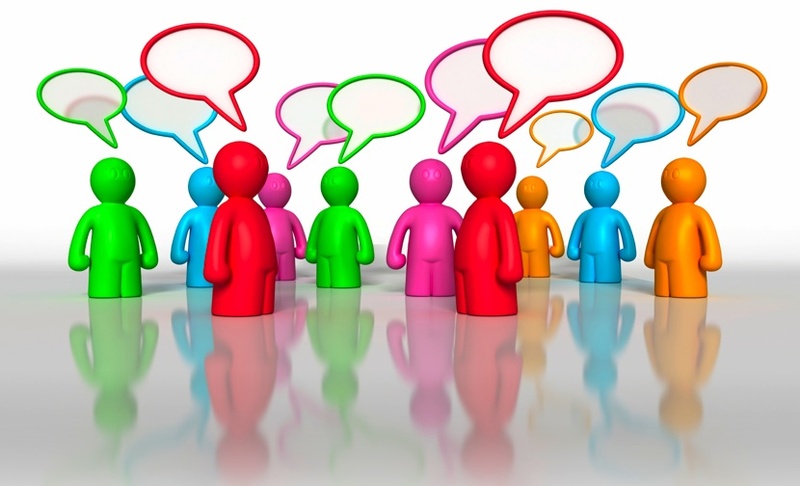 Interact and connect with others – get your name out there! Likes to cover big or small stories that affect people’s day-to-day lives. Journalists rely on Internet readers’ ideas to gather and present news. George Mason University’s Copyright Officer, Claudia Holland, visited our Online Journalism class on Feb. 3, to discuss copyright issues. Holland said that copyright “secures for limited times to authors and inventors the exclusive right to their respective writings and discoveries.” Copyright lasts for the lifetime of the author, plus an additional 70 years. 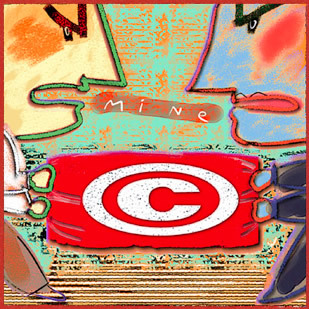 Copyright laws are beneficial to authors and/or inventors, and the general public; authors and/or inventors receive monetary benefits, while the general public receive educational benefits. Expression of an individual’s creativity. Element of originality that does not have to be unique. Ideas, methods of operations, principles. This means that an individual cannot prove that he/she created an idea. Basic facts v. compilation of facts. Public Domain. For example, government documents belong to the public. Titles, names, short phrases or slogans. Generally, anything published prior to 1923. Holland also discussed the Doctrine of Fair Use, which allows individuals to use copyrighted materials under certain limitations. Holland listed “Four Fair Use Factors” that help individuals determine if their use is fair use. Purpose and character of the use. Is the content being used for education, research? Or is it being used to make money? Amount and substantiality. The rule of thumb is to use 10% of the work. Note, the 10% cannot be the heart/key element of the work! Affect the use of the potential market. The most important message in Holland’s lesson plan is that one must always give attribution! What common problems have students gotten into regarding following copyright rules? Above is my media pyramid that displays my media consumption. Television shows, magazines and television news are bunched up in the middle because I fit them in when I get a chance. 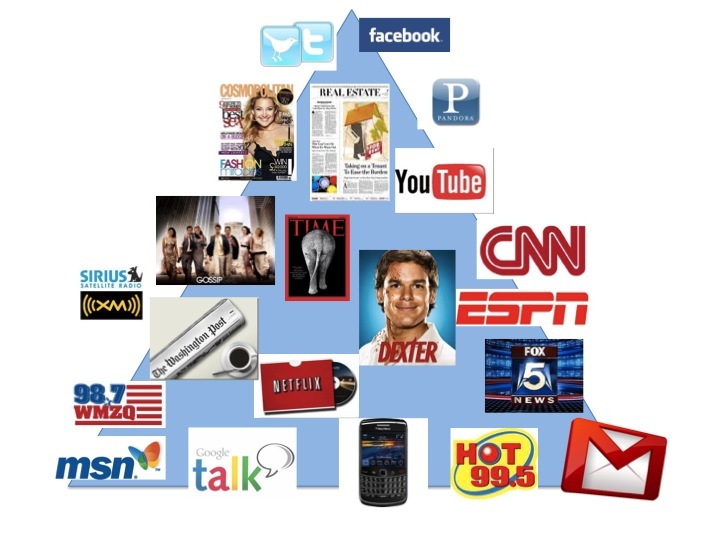 At the very top of my pyramid are Twitter and Facebook. Even though I know a lot of people my age that are addicted to both sites, I cannot get myself to browse Twitter and Facebook for more than 30 minutes. I’d rather stay connected by giving someone a call or sending a text message! Blogs are important because they are simple, immediate and interactive. What is a good short description or catchphrase for your blog? Organize your ideas. All posts should complement your primary idea. Be direct. Use simple, declarative sentences. Be the authority, with a personality. The right voice is key. Edit. Allow 15 minutes of editing time before publishing a post. Make posts scanable. Use different typographical techniques. Link, summarize and analyze. Attribution is very important! Bloggers should also post approximately once a day and participate in a blogging community by reading, commenting and linking to other blogs. Briggs breaks down basic Web concepts so that we can maximize and take advantage of all the information the Web offers. Internet is not synonymous with World Wide Web. Internet: a network of connected computers that share information. Web: a way of accessing information through the network. RSS is a quick and efficient tool in obtaining information based on your personal interests. HTML, CSS and XML are markup languages that control how information is displayed and distributed on the Web. XML is a complement for HTML.